Cass Community Social Services (Cass) and Ford Motor Company Fund unveil the second piece of their Ford Mobile Farm project collaboration – the Ford Freight Farm, a 40-foot shipping container that grows nutritious food hydroponically. Cass Community Social Services, a Detroit nonprofit dedicated to providing area residents with food, housing, health services and job training, is housing the Ford Freight Farm in a shipping bay at its World Building headquarters in Detroit. A small space has been developed, creating a teaching area for school classes, volunteers and others. Ford Fund and Cass Community Social Services are longtime collaborators on community projects, including the Cass tiny homes neighborhood. 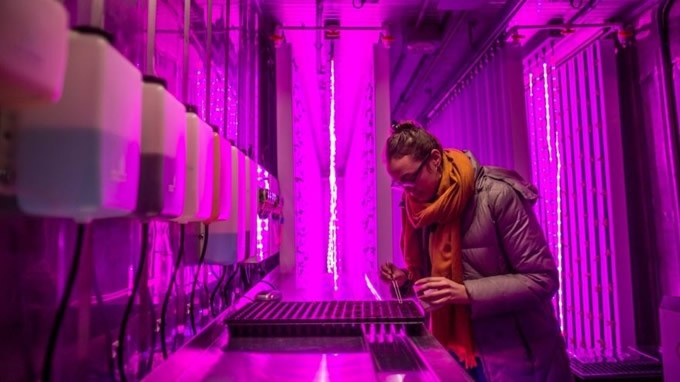 The 40-foot freight container is equipped with LED lighting to enable seeds to sprout and vegetables to grow. The indoor farm operates without the use of pesticides, sunlight or soil. It also utilizes 90 percent less water than would normally be used. Hundreds of vertical towers house produce that is fed by water infused with nutrients. The container has the growing capacity of up to two acres of land and will produce up to 52 harvests per year. The unit will be partially powered by solar panels to reduce environmental impact and offset operating costs. Cass is currently growing lettuce, greens and herbs that will be utilized in the nonprofit’s community kitchen that serves more than 700,000 meals each year. The growth cycle for current plant varieties (lettuce, mustard greens, basil, Swiss chard and kale) is approximately four-to-five weeks from seed to mature plant (ready for harvest). Harvests will be staggered, allowing Cass to continually start growing new plants. In addition to providing fresh, healthy produce to its community kitchen, the Ford Freight Farm will also provide some part-time employment opportunities for adults with development disabilities. Beginning in 2019, produce will be sold to area restaurants to create an income stream to help support the freight farm. In March 2018, Ford Fund and Cass unveiled the first part of the Ford Mobile Farm project, introducing the (truly) mobile piece of the project; a F-150 pickup truck with a garden bed and glass, geometric cover that visits local schools to teach healthy eating habits and provides hands-on learning opportunities for children. The Mobile Farm school program runs in the spring and fall seasons. The Ford Mobile Farm is the brainchild of millennial Ford employees who participated in the 2017 class of Thirty Under 30, a philanthropic leadership program launched by Ford Motor Company Executive Chairman Bill Ford to create a new generation of community-minded employees. The Thirty Under 30 team was challenged with improving Ford Mobile Food Pantries, a successful food distribution program launched in 2008 to address increasing hunger needs across metro Detroit. Team members toyed with the idea of creating a farm in the bed of an F-150, which led to growing vegetables inside a 40-foot shipping container. The Ford Mobile Farm project received $250,000 in funding from the Bill Ford Better World Challenge, a grant program funded by Ford Motor Company Fund and Bill Ford personally to provide support for employee ideas capable of transformational change. The grant helped support the purchase and outfitting of the freight farm, the hiring of a person to oversee the farm and the educational arm of the program, including the preparation of an F-150 for school visits. Cass Community Social Services, Inc. (Cass) is dedicated to making a profound difference in the lives of the diverse populations it serves by providing for basic needs: food, housing, health care/mental health care and jobs for people living in areas of concentrated poverty in Detroit. Each night 300 adults and children experiencing homelessness stay in a Cass facility, 80 people with significant barriers to employment have jobs at Cass Green Industries, and 125 persons with developmental disabilities participate in special programs each week. 90 cents of every dollar donated is spent on Cass programs. For more information, visit www.casscommunity.org. Join us on Facebook @CassCommunity and Twitter @CassCommunity.